Applications for this Institute are closed. Accepted applicants should register by May 15, 2019. Georgia State University and the Course-based Undergraduate Research Experiences Network (CUREnet) invite you to a CURE Institute. 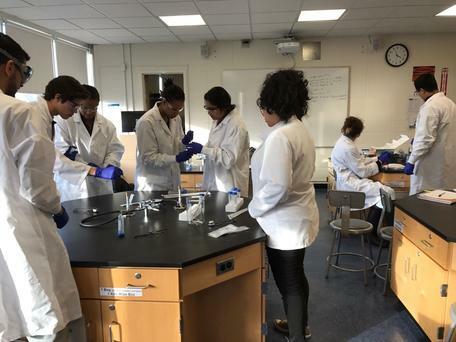 During the Institute, participants will learn about and use evidence-based instructional strategies to develop plans, instructional materials, and assessment tools for integrating a science research project into their science laboratory course. Emphasis will be on the life sciences, but participants from other natural sciences and the social sciences are welcomed. The overarching goal of the CURE Institutes is to build faculty capacity to design and implement CUREs in the natural and social sciences. All institute sessions are designed based on research on learning in general and undergraduate research experiences in particular, will make use of active learning and equitable teaching strategies, interspersed with time for participants to apply what they are learning to design their CUREs and get feedback on their design. Please make arrangements to attend all Institute sessions. All Institute participants will receive a certificate of acknowledgment. There are no costs for participating in the Institute. Breakfast will be provided all days of the Institute and lunch will be provided on Wednesday and Thursday. Participants must cover any travel and dinner costs. Any individual who plans to teach a CURE in the natural or social sciences is eligible to apply. A CURE involves an entire class of undergraduate students in addressing a research question or problem that is of interest to a broader community, such as the scientific community or other stakeholder outside the classroom (e.g., a community organization such as a watershed group). Individuals who are new to CURE instruction, who are teaching introductory level courses, and/or who are teaching at colleges or universities that enroll traditionally under-served populations (e.g., under-represented minority students, first-generation college students) will be prioritized. This CURE Institute will be held on the Georgia State University campus in Room 226 in the Classroom South Building, 95 Decatur Street, Atlanta, GA. It is building #3 in the attached map (Acrobat (PDF) 1.2MB Feb12 19). Daily parking is available in various decks for a fee. G Deck adjoins the Classroom South Building. Participants must make their own travel and lodging arrangements. Two reasonably priced and conveniently located hotels are the Residence Inn (134 Peachtree St. NW, Atlanta, GA; 404-522-0950) and the Courtyard Marriott (133 Carnegie Way NW, Atlanta, GA; 404-222-2416). For more information about the Institute, please contact Erin Dolan (eldolan@uga.edu) or Paul Ulrich (pulrich@gsu.edu). CUREnet and CUREnet2 are supported by the National Science Foundation under Grant Numbers 1450729 (2011-2016) and 1730273 (2017-2010). Any opinions, findings, and conclusions or recommendations expressed in this material are those of the authors and do not necessarily reflect the views of the National Science Foundation. Map is owned by Georgia State University and it is in the public domain.